Over the past year or so there seems to be a scooting competitiveness that has spread through the Boo Roo and Tigger Too. Roo started the trend with scooting to school, followed by me throwing myself into some scooting action for the Team Honk Relay earlier this year. Since then Roo and I have been having races, which I think Mr Boo was a little jealous of as he didn’t have scooter to take part in. So with the arrival of the Zinc Outbrake II Stunt Scooter I kindly offer Mr Boo my blue scooter and I took control of the new Zinc scooter (after all this one is a dark purple with a pink footplate). What are Zinc stunt scooters? Now whilst I have quite gotten into scooting I am by no means able to do stunts. I can feel the difference between this scooter and my old one in that this one feels more nippy and the larger handlebars allow you to distribute the weight load. 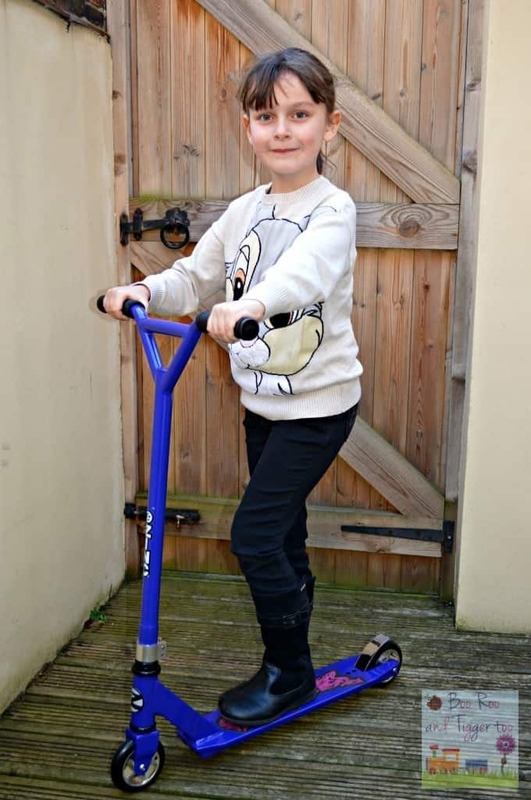 The Zinc Outbrake II Stunt Scooter is available from Argos with a RRP of £99.99, however is currently on offer at just £49.99 which I think offers great value for money. Disclosure: We received a Zinc Outbrake II Stunt Scooter FOC for the purpose of review. The scooter looks great, and at a bargain price whilst it’s on offer! Love the look of this scooter, looks like so much fun.